A Name You Can Trust, Service You Can Rely On! Need A Free Estimate or Have A Tree Service Emergency? Contact Eagerton Tree Service Today! Since 1954 the name “Eagerton” has stood for uncompromised, quality service, first as a residential and commercial plumbing contractor and then as an Expert Tree Service business. Being brought up in a business that solely rely’ s upon satisfying customers is an important part of the “Eagerton Service Tradition”. Three generations of service conscious experts, serving homeowners and businesses alike in the Northeast Florida area. We have built our business and reputation on serving one customer at a time. The job is never finished until the customer is 100% completely satisfied and our repeat and referral customers have come to expect more from all of their service providers because of this Eagerton service pledge. That is why we have always said, Eagerton is “a name you can trust and service you can rely on. Family owned, family run experts. What separates Eagerton Tree Service from all the others? Knowledgeable, Experienced and Affordable Tree Service, serving Duval and Clay County including Orange Park, Fleming Island, Green Cove Springs, Westside, Downtown, Southside, San Marco, San Jose, Mandarin and Julington Creek. Eagerton Tree Service combines years of experience with modern technology to bring homeowners and small business owners common sense, zero-impact to your property tree service. Whether you are looking to remove a forest for expansion plans, eliminate a dead or dying tree that can cause damage to your property or dwelling, or are in need of expert spring, summer or fall tree trimming and pruning, Eagerton Tree is your one-source company. We treat all our customers properties like they were our own. Modern technology combines modern tree removal methods with state-of-the-art communication and safety devices each of our workers are required to be fitted with. Taking out a tree is one of the most dangerous jobs, as licensed and insured experts we take that responsibility very serious. From on the job site wearing of hard hats to communicating with two-way radio devices, all of our project workers are highly skilled and trained to remove trees and limbs safely and with Zero-damage to the job site. Old fashion tree removal methods only required a couple of strong backs equipped with chain saws, ropes and space to drop the tree trunks down to the ground, causing a potential hazard to workers, spectators, and damage to buildings, properties and lawns. As Professional tree removal experts, we employ a 30-ton Crane Service, a boom truck with a 116 ft reach capability to professionally remove the entire tree piece by piece. As the tree trunk and large limbs are removed they are safely placed in our dump truck and smaller limbs are then cut and chipped on site. Our 30-ton crane doesn’t do any damage to concrete driveways either, always a major concern to home and property owners. Our Emergency Tree Service is available 24-hours a day, 7-days a week. We not only answer our phones at all times of the day and night, we react if the situation warrants it to all emergency calls. Fallen trees are a danger to property, life and limb and downed power lines can cause death. 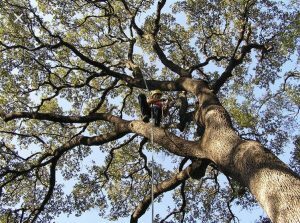 Emergency, on-site services and inspections are sometimes required and Eagerton Tree Service is there to help. 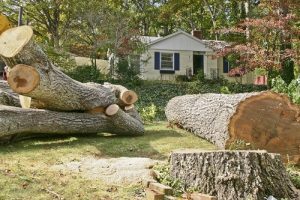 We don’t remove trees in the middle of the night but we do make an accurate assessment of the situation and damage, so you can rest assured that your project will get the immediate attention it deserves. Fallen limbs and trees are usually not planned events but at Eagerton Tree our plan is to get you the immediate help you deserve. 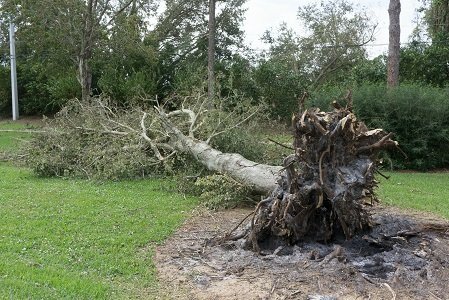 So, if you are in need of any type of tree service in Jacksonville (tree removal, tree trimming or emergency tree service) Eagerton Tree Service is ready to serve your needs. In every town there is at least one tree service company who’s service stand above the rest. Jake Eagerton has created that business model providing affordable, tree services for residential and commercial customers. Our formula is simple. Find the right workers, provide the right training, have a quality service pledge to your customers and deliver on all commitments. Eagerton Tree Service has evolved out of that customer pledge, because we know that there are many tree services to choose from. No matter how large or small your tree project might be, Eagerton Tree is ready to provide you with the right service at the right price and do all that in a timely manner. Give us a call today and have one of our service managers review your options, pricing and vision for your next tree project.